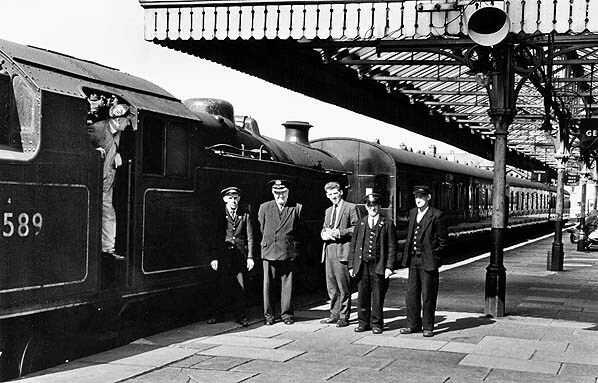 Station staff including stationmaster Arthur Herbert pose for the photographer - Arthur's son, Ron - on platform 1 at Morecambe Euston Road station in August 1961. Standing at the platform on a local service is ex-LMS Stanier 2-6-4T No.42589. 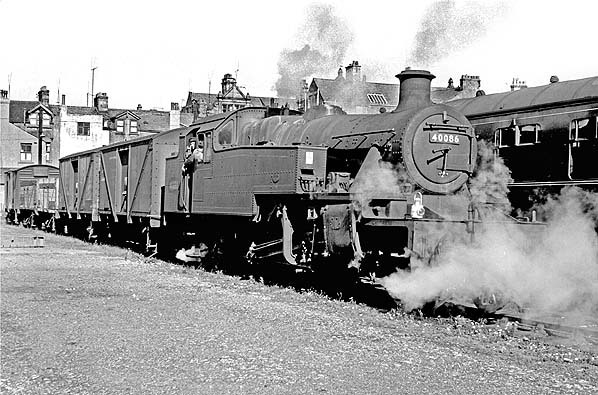 Built at North British Loco Co, Glasgow, and entering LMS service on 19 October 1936 numbered 2589, it had a service life of nearly 28 years when it was withdrawn on 12 September 1964 from Wigan Springs Branch shed. The locomotive was broken up during January 1965. Station staff once again pose for the photographer on platform 1 at Morecambe Euston Road station in August 1961. 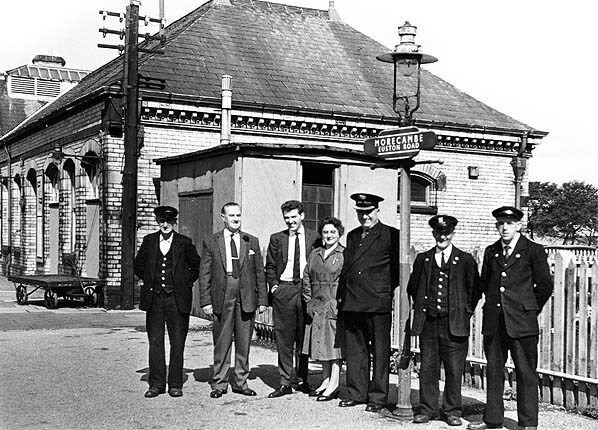 Stationmaster Arthur Herbert stands to the left of the lamp post. The station received the BR London Midland Region maroon totem signs of the half-flanged variety early in the BR era. All stations in the area were fitted with totems. 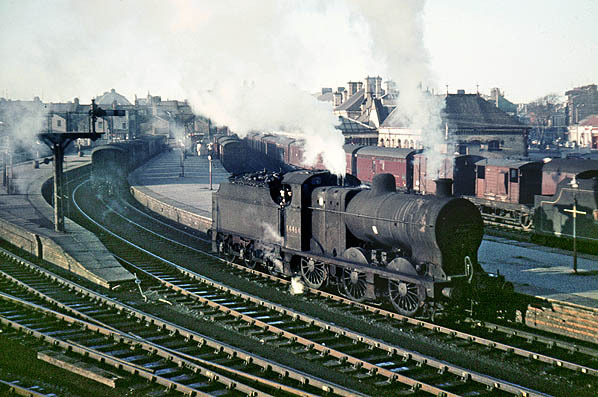 The Morecambe Euston Road goods yard in September 1961. 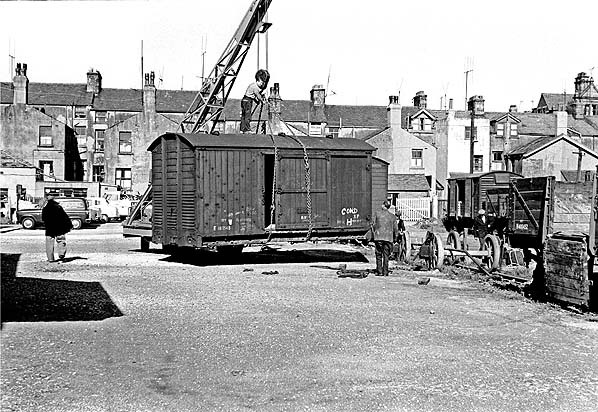 A condemned box van is being lifted from its wheels having been purchased by local company W J Cross, builders' merchant who occupied part of the yard. 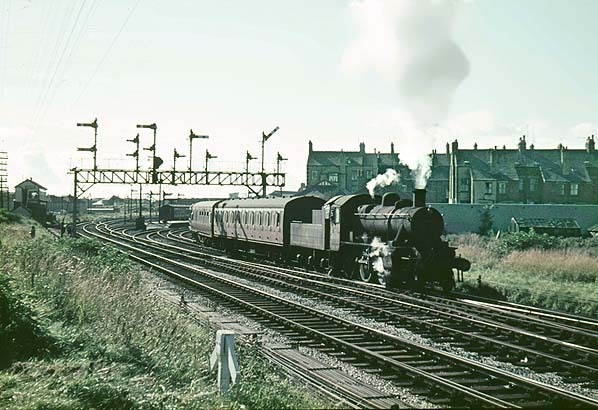 Looking north-west in the Morecambe Euston Road goods yard in September 1961. Locomotive No.40086 is seen performing shunting duties whilst working the 11.22am Morecambe Promenade to Carnforth freight which called at Euston Road and Bare Lane as required. With just over 12 months’ service left this Stanier-designed 2-6-2T 3P is a development of Fowler's design with a taper boiler. 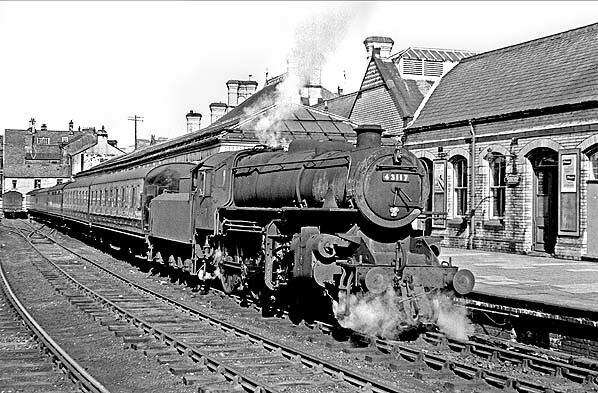 This locomotive entered service on 8 April 1935 after being built at Derby works of the LMS. 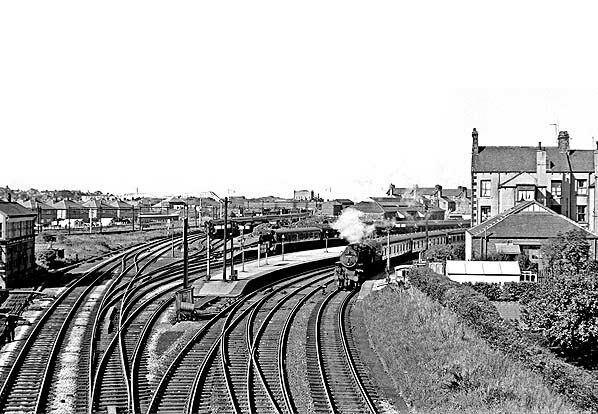 It was withdrawn from Llundudno Junction shed on 24 November 1962 and scrapped at Cashmores of Great Bridge during May of 1963. The 11.48am Morecambe Euston Road to Lancaster Castle service is seen standing at Euston Road station platform 1 on Thursday 7 September 1961. At the head of the train is locomotive No.43117. The locomotive was built at Horwich works to Ivatt's 4MT design and entered service on 9 June 1951. It had a service life of 16 years, being withdrawn from 52F North Blyth shed during July of 1967, and it was scrapped four months later. Looking north-west at Morecambe Euston Road station from the Euston Road signal box on Thursday 7 September 1961. The 11.48am local train to Lancaster Castle hauled by 43117 (as seen above) is preparing to depart from platform 1. An excursion service stands in platform 4. The two excursion platforms never had any buildings. on the Ribble Steam Railway at Preston. The Euston Road pilot engine is seen at Euston Road station in December 1963. 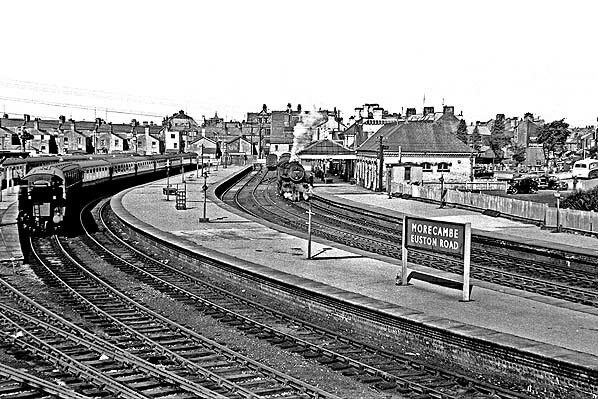 With the last passenger service leaving Morecambe at the end of the 1962 summer timetable the station remained open for goods traffic until 1972. Parcels wagons are seen in the passenger platforms being remarahalled. A Southern Region goods brake van is seen in the background. Goods brake vans were used on parcel trains as there was no steam heating and they had coal stoves. With just six months service left before withdrawal 44464 is an ex-LMS 4F built to a MR design by Fowler. Built at Horwich works and entering service in May 1928, this loco had a service life of 36 years, when it was withdrawn from Carnforth shed in May of 1964 to be broken up in August of the same year. These 4Fs were known as 'Derby Fours' by some because the original MR locos were all built at Derby, and some trainspotters knew them as 'Duck Sixes' because of their wheel arrangement. A few weeks before track-lifting in the passenger platforms coaches are stabled in platform 1 at Morecambe Euston Road in May 1965. Note the unusually large toilet block on the left with two entrance for the gents' and the ladies’ out of view behind the photographer. 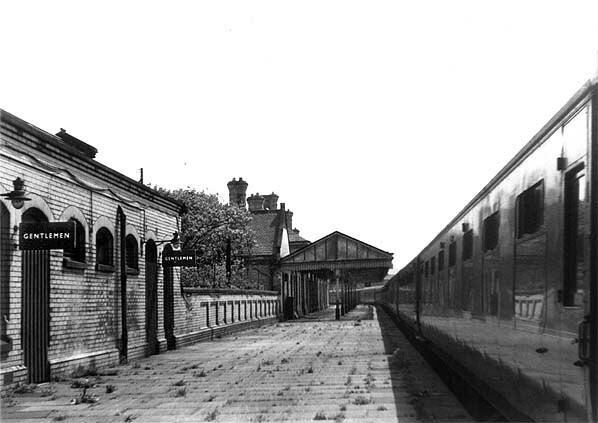 Such a large toilet block was clearly required to cater for the large number of passengers passing thorough the station on summer weekends. Morecambe Euston Road station forecourt in May 1965 with its imposing porte cochère providing shelter from the weather for arriving passengers. Although the station had been closed for three years little appears to have changed. 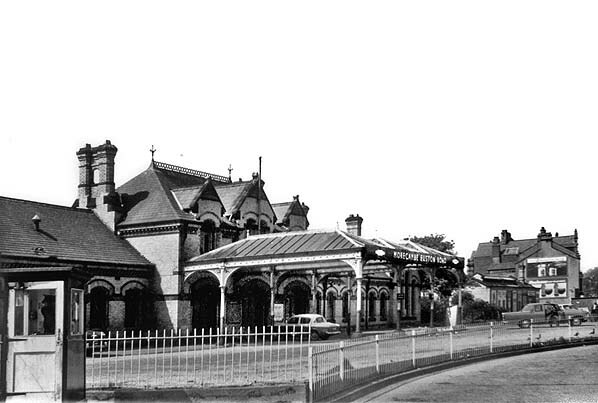 The lack of cars in the car park is perhaps one indication that the station is no longer in use.